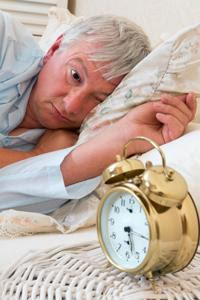 As people get older, it may become more challenging to get a good night's sleep. Due to physical and mental changes, illnesses, and increased aches and pains, it can become difficult to fall and stay asleep. A lack of sleep can exacerbate medical conditions as well as confusion and functioning during the day. Limit napping: Older adults may be more fatigued during the day and may want to nap, but this can throw off sleep patterns and make it more difficult get rest at night. If seniors do need a nap, it's best to schedule it for late morning or early afternoon and limit it to no more than 30 minutes. Stay active: Engaging in daily physical activity, whether it's traditional exercise like walking or aerobics class or something like gardening or cleaning, can help patients get a better night's sleep. Being active uses up energy, making you more tired when bedtime comes around, and exercise reduces stress, which can affect sleep quality. Have a bedtime: Inconsistency when it comes to going to sleep can throw off a person's circadian rhythm and make it challenging to fall asleep easily and quickly. Instead, suggest that seniors have a similar bedtime each night, even on weekends, so their bodies can get used to a routine. Their bodies and minds will start to recognize when it's time to unwind.